Pathogenic keratinophillic fungal attacks of keratinous structure (skin, hair & nail) due to fungi ability to use keratin, causing ring worm disease or tinea. PEVISONE Is a well-balanced combination of econazole nitrate and triamdnolone acetonide, intended for use in der¬matology. Econazole nitrate is a broad-spectrum antimycotio that acts against dermatophytes, yeasts, and mouldsi.moreover, It is also active against gram positive bacteria (eg. staphylococci). Triamcinoione acetonide develops marked antinflammatory, antipruntic, and anti-allergic effects. Both econazole nitrate and trfamcInolone acetonide have been shown to develop their full efficacy in the combination preparation PEVISONE. These vehicles make close contact between active substances And skin possible. Eczema: inflammatory dermatoses with mycolic and/or bacterial infection inflammatory dermatomycoses caused by dermalophytes, yeasts, and moulds. Mycotic affections in the body folds, also in the presence of bacterial secondary ancffor mixed Infections. 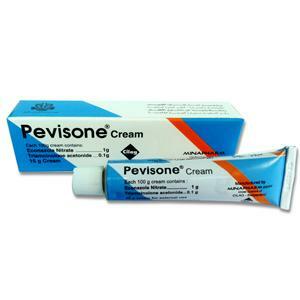 PEVISONE cream is useful in particular for the treatment of moist, oozing, acute/subacute dermatoses. 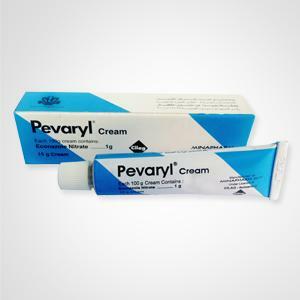 PEVISONE ointment inmost helpful In the treatment of dry subchronickhronlc dermatoses. Apply PEVISONE cream or ointment to the affected skin areas twice a day (morning and evening) and rub it In gently. Like with any other preparation containing corticoids, treatment with PEVISONE should - If possible - be limited to a period of 3 to 4 weekstin order to prevent skin damage caused by corticoids (atrophy, telanglectaaes, striae). Warning: Avoid prolonged application to thin skin and to the face. Two-week to four-week therapy of eczematous diseases wit normally result In complete cure. Treatment with PEVISONE of inflammatory mycoses should continue until inflammation disappears. 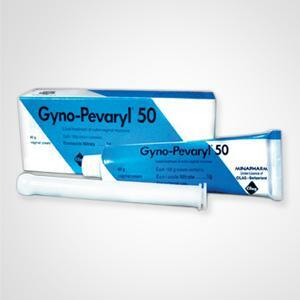 If necessary the therapy can then be carded on using PEVARYL until complete cure is obtained. 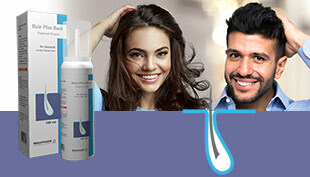 Cream has a rapid drying effect and does not stain.